A myocardial infarction (MI) results in cardiomyocyte (CM) necrosis, which is then replaced by fibrotic tissue. Myocardial fibrosis disrupts myocardial electrical integrity and delays electrical signal propagation, contributing to asynchronous cardiac contraction [1,2]. Accumulated evidence suggests that myocardial fibrosis is a major contributor to cardiac arrhythmias including atrial fibrillation and ventricular tachycardia [3-5]. Patients with conduction delay (and a prolonged QRS) after a myocardial infarction frequently require resynchronization pacing to improve outcomes (morbidity and mortality). The presence of myocardial fibrosis changes the polarization route and delays the conductive velocity of the tissue. Re-establishing normal electrical impulse propagation across scar tissue by reducing external resistance within the fibrotic myocardial tissue may restore conduction toward normal and activate islands of surviving myocardium, which may permit synchronous cardiac contraction and the restoration of cardiac function. Biomaterials are advantageous for use in tissue engineering to restore function of the injured heart [6-8]. Injectable hydrogels have been shown to reduce infarct thinning and dilatation, enhance stem cell engraftment and survival, and improve ventricular function in animal models [1,9,10]. A recent clinical trial concluded that exercise capacity and clinical symptoms were improved in patients with advanced heart failure (HF) treated with alginate hydrogel compared to standard therapies . The injection of a hydrogel could be an efficacious technique to introduce material to the heart for the purpose of changing the conductive characteristics of myocardial fibrotic tissue. Polypyrrole (PPY) is a well-known conductive polymer. However, PPY is non-thermoplastic, mechanically rigid and brittle. When conjugated with other biocompatible materials, such as collagens, its biocompatibility is improved without significantly affecting its conductivity [12,13]. It is thus a very promising conductive biomaterial in cardiac research. The use of conductive polymers to improve heart electrical impulse propagation and synchronous CM contraction is a new investigative direction. In our previous study , we showed that PPY:chitosan (CHI) has good mechanical properties and injection of PPY:CHI around the scar significantly improved border zone conduction velocity with improved cardiac function. However, very few studies have shown that conductive biomaterials can synchronize cardiac electrical signals and improve conduction velocity across fibrotic tissue [15,16]. In the present study, we performed in vitro experiments to investigate the ability of PPY:CHI to synchronize contraction of spontaneously-beating CM clusters and in vivo studies to establish the feasibility of the biomaterial to improve cardiac scar tissue electrical propagation. Chemical oxidative polymerization was used to create a PPY:CHI hydrogel . In brief, a 2% (w/v) CHI stock solution was prepared by dissolving the required amount of CHI powder (Sigma Aldrich, St Louis, MO) in deionized water containing 1% (v/v) acetic acid, which was mechanically stirred for 12 h until a clear light yellow solution was obtained. Liquid pyrrole (Sigma Aldrich) was then added to this stock solution to create three different biomaterial solutions: CHI, 3PPY:10CHI, and 3PPY:5CHI. FeCl3 (Sigma Aldrich) was used as a catalyst to polymerize pyrrole monomers (Sigma Aldrich) into PPY. This reaction process was maintained for 48 h. At the end of this reaction, the mixture was dialysed for 12 h with a molecular weight cut-off of 12-14 kDa, using a dialysis bag (Fisher Scientific, Ottawa, ON, Canada) incubated in 0.1% phosphate buffered-solution (PBS). 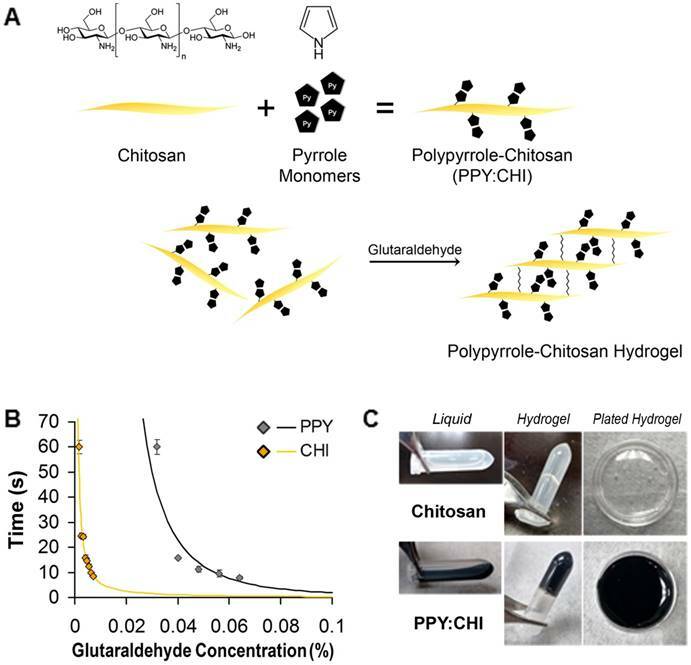 5% (w/v) β-glycerophosphate (Sigma Aldrich) was added to adjust the pH of the biomaterial solutions to a physiological range (7.1-7.3), as CHI is a pH-sensitive hydrogel . One mg/mL collagen (Corning Life Science, Bedford, MA) was then added to the CHI and PPY:CHI solutions to improve cell adherence. Finally, hydrogel formation was induced by addition of glutaraldehyde (Sigma Aldrich) to a final concentration of 0.004% (for CHI) and 0.04% (for 3PPY:10CHI) as a cross-linker to achieve a gelation time of 15 s. This low concentration is similar to the preparation of bioprosthetic valves employed in clinical practice . 3PPY:5CHI did not form a hydrogel, possibly due to fewer available functional groups on the backbone of CHI, and thus the 3PPY:10CHI ratio was used in all subsequent experiments, and is referred to as PPY:CHI herein. All experimental protocols for the animal studies were approved by the Animal Research Centre of the University Health Network and conformed to the Guide for the Care and Use of Laboratory Animals (NIH, 8th Edition, 2011). CMs were isolated from 1-day-old neonatal Sprague-Dawley (SD) rats using enzymatic dissociation methods as previously described . In brief, 13-14 hearts were collected from neonates and minced in ice-cold PBS supplemented with 10 g/L glucose (Merck, Darmstadt, Germany). Minced heart tissue was washed 3 times to remove excess blood and transferred to a 50 mL tube for digestion. A 3.5 mL enzyme mixture composed of collagenase (280 U/mg, Worthington, Lakewood, NJ), trypsin (250 U/mg, Gibco, Burlington, ON, Canada) and DNase (61577 U/mg, Calbiochem, Etobicoke, ON, Canada) was added at the start of each digestion cycle. The tissue-enzyme mixture was gently agitated at 37 °C for 10 min. At the end of each digestion cycle, the supernatant, containing cells, was transferred into a sterile bottle containing 25 mL Dulbecco's modified Eagle's medium/ Nutrient Mixture F-12 (DF-12) media (Invitrogen, Burlington, ON) supplemented with 20% FBS. Six digestion cycles were performed. Cells were collected and purified by Percoll gradient (GE Healthcare, Mississauga, ON). Purified CMs were incubated in DF-12 media supplemented with 10% FBS for future experiments. Cell viability was assessed using a trypan blue exclusion assay. Dead or dying cells (which have damaged plasma membrane) will take up trypan blue dye and be stained blue, whereas viable cells (possessing an intact plasma membrane) will not. One million freshly isolated neonatal rat CMs from 1-day-old SD pups were cultured for 3 days in 35 mm control (polystyrene) dishes and biomaterial-coated dishes (CHI and 3PPY:10CHI). Cells were then incubated with trypan blue staining solution for 1 min followed by washing 3 times using PBS solution. DAPI (4',6-diamidino-2-phenylindole) staining was used to quantify total cell numbers. All dishes were imaged using an Eclipse Ti-S inverted fluorescence microscope system and analyzed using NIS-Element BR v3.2 software (Nikon Instruments, Melville, NY). Quantification was performed manually by counting the number of trypan blue-positive cells and the total number (DAPI-positive) of cells. Cell viability was expressed as % of living cells versus the total number of cells. To evaluate whether our conductive polymer is able to synchronize spontaneously-beating CMs, we designed an in vitro experiment by culturing CM clusters separately with no cells in between to recreate the isolated islands of CMs retained in fibrotic tissue. Neonatal rat CMs were isolated as outlined previously and plated in uncoated, CHI-, and PPY:CHI-coated 35 mm polystyrene plates. A glass ring (10 mm diameter, 2 mm thickness) was placed in the plate to prevent cell growth in the region covered by the glass ring. This created two isolated CM populations separated at 2 mm distance, termed the peripheral group and central group, respectively (as illustrated in Figure 3). When cultured cells reached confluency, the glass ring was removed from the dish and spontaneous calcium transient propagation was observed and recorded as outlined below. Spontaneously-beating CM Ca2+ transient propagation was measured to evaluate the degree of electrical activity synchronization between the peripheral and central CM populations in the three groups. In vitro CM Ca2+ transient propagation was measured by incubating CMs with the Ca2+ indicator Fluo-4 AM (acetoxymethyl; 5 µM; Life Technologies, Burlington, ON, Canada) for 30 min, then washing with Tyrode's solution. Fluo-4 AM was then excited at 488 nm and emission at >515 nm was detected with a camera, as detailed below. The electrical signal conduction kinetics of the ex vivo Langendorff-perfused rat hearts were measured by perfusing rat hearts for 10 min at a rate of 3 ml/min with 10 µM of the voltage-sensitive dye di-4-ANEPPS (3-[4-[(E)-2-[6-(dibutylamino)naphthalen-2-yl]ethenyl]pyridin-1-ium-1-yl]propane-1-sulfonate) [Life Technologies] diluted in a high potassium cardioplegia solution. Di-4-ANEPPS was excited at 510 nm and emission at >570 nm was detected as detailed below. Both Ca2+ transient propagation and electrical signal conduction kinetics were recorded using an optical high-speed electron multiplied charge-coupled-device (EMCCD) camera system (Evolve 128, Photometrics, Tucson, AZ) coupled to a dissecting microscope. Ca2+ transients were recorded at 485 frames/s with a resolution of 60.5 µm/pixel, while electrical impulse images were recorded at 883 frames/s with a resolution of 191.9 µm/pixel. For electrical signal recording of Langendorff-perfused rat hearts, scar tissue was positioned in the center of the view. The measuring start point was identified as the first electrical signal appearing on the heart within the view and marked as time 0, and the end point was marked as where the electrical signal propagated at time 12.4 ms (the time of the last frame before the electrical signal propagated out of the view in healthy hearts). All data were obtained using μ-Manager (NIH, Bethesda, MD), and analyzed using ImageJ (NIH, Bethesda, MD) and BV Analyze software (BrainVision, Morrisville, NC). Portions of recordings containing visible fluorescence were processed using a low pass filter at 100 Hz and pseudocoloured. Multiple processed images were stacked to generate isochronal maps of peak signal propagation over time. Audio-video interface (AVI) movies of recordings are available in Supplementary Material. All experimental protocols were approved by the Animal Research Centre of the University Health Network and conformed to the Guide for the Care and Use of Laboratory Animals (NIH, 8th Edition, 2011). Female SD rats weighing 180-230 g underwent left lateral thoracotomy and cryoablation-induced injury on the lateral wall of the left ventricle as we previously reported . Rats were anesthetized, intubated, and ventilated with 2% isoflurane (Pharmaceutical Partners of Canada, Richmond Hill, ON). The skin on the chest was cleansed with 70% ethanol and covered with sterile (autoclaved) gauze. A left lateral thoracotomy was made to expose the heart. Cryoinjury was induced by applying a 5 mm-diameter probe chilled in liquid nitrogen on the mid-lateral wall of the left ventricle for 1 min. This process was repeated 10 times at 30 s intervals. The chest was then closed and animals were given buprenorphine (0.05 mg/kg) and Duplocillin® LA (15,000 IU/kg) for analgesia and to prevent an infection. All animals were randomized into saline-, CHI-, or PPY:CHI-injected groups 1 week after cryoinjury. Once again, a thoracotomy was performed to access the heart, where the ventricular scar was visualized as a white-grey area on the lateral wall of the left ventricle. Multiple injections were used to deliver a total amount of 100 µL of saline, CHI, or PPY:CHI into the scar region using a 28-gauge needle (BD Biosciences, Mississauga, ON). The chest was then closed and animals were given buprenorphine (0.05 mg/kg) and Duplocillin® LA (15,000 IU/kg) for analgesia and to prevent an infection. All animals were sacrificed four weeks after injection for optical mapping experiments. Hearts from female SD rats were extracted after animals were heparinized and euthanized by an isoflurane overdose (5%) in accordance with experimental protocols approved by the Animal Research Centre of the University Health Network. To stop the heart and preserve cell viability during ischemia, retrograde perfusion was performed with an ice-cold cardioplegic solution (140 mM NaCl, 4 mM Tris, 30 mM KCl, 5 mM MgSO4, 25 mM glucose, 30 mM histidine, pH 7.15). The heart was then cannulated using a blunted 27G needle inserted into the aortic root, and perfused with the cardioplegic solution containing 10 µM voltage-sensitive dye di-4-ANEPPS at a rate of 3 mL/min for 10 min. Finally, the cannulated heart was excised, placed on a customized Langendorff apparatus, and perfused with Krebs-Henseleit solution (117 mM NaCl, 24 mM NaHCO3, 11.5 mM glucose, 3.3 mM KCl, 1.25 mM CaCl2, 1.2 mM MgSO4, 1.2 mM KH2PO4) aerated with carbogen (5% CO2/95% O2) at 37 °C at a rate of 5 mL/min. Excitation-contraction uncoupling agent blebbistatin (5µM, Sigma Aldrich) was used to reduce motion artifact. All experiments were conducted at room temperature. Electrocardiograms (ECG) were obtained at three time points: prior to cryoinjury, 1 week after injury prior to biomaterial injection, and 4 weeks post-injection of biomaterial. Briefly, rats were anesthetized using 5% isoflurane for 3 min, intubated, and kept under constant 2% isoflurane anaesthesia during the recording. A 5 minute recording was obtained using three surface leads—positive (left thoracic surface), negative (right thoracic surface), reference (left lower limb)—connected to a PowerLab 4/30 data acquisition system (ADInstruments, Dunedin, New Zealand). Recordings were observed, analyzed, and quantified using PowerLab 6 software (ADInstruments). Average QRS interval duration, an indicator of synchronized ventricular contraction, was determined by quantifying 4-5 cardiac cycle waves per animal. The ability of biomaterials to improve electrical signal propagation across non-conductive tissue was determined by measuring stimulator-generated electrical impulses across isolated scar tissue. Cryoablation-induced left ventricular scars in female SD rat hearts were injected with saline, CHI, or PPY:CHI at 1 week post-injury as outlined above. At 4 weeks post-injection, hearts were perfused with Ca2+-free Tyrode's solution and extracted after animals were euthanized by an isoflurane overdose (5%). Extracted hearts were further dissected in order to isolate the left ventricular scar tissue. Isolated scar tissue sections with 3 mm healthy myocardium on both ends were then placed on a platform and attached to a Medtronic 5375 Demand Pulse Generator (Medtronic, Minneapolis, MN) and PowerLab 4/30 cardiomyograph (ADInstruments, Dunedin, New Zealand). The pulse generator probe and recording probe were 1 cm apart for all recordings. Pulse generator settings were 20 mV, 0.1 mA, and 80 pulses/min, and cardiomyograph readings were visualized and measured using LabChart 6 software (ADInstruments). Approximately 35-40 voltage peaks were measured for each tissue section and averaged. Tissue sections from 4 separate animals from the saline, CHI, and PPY:CHI-injected groups were analyzed. Statistical analysis was performed using Origin (OriginLab Corporation, Northampton, MA) and Excel software (Microsoft, Redmond, WA). An analysis of variance (ANOVA) was performed to compare multiple groups at one timepoint or a single group at multiple timepoints. If the F ratio was significant either for a main effect or for an interaction between time and the effect, then the differences were specified using post-hoc Newman-Keuls Student's t-tests. A post-hoc two-way unpaired t-test was used to compare two groups at a single timepoint, and a two-way paired t-test was used to compare one group over two timepoints. Data are presented as mean ± SEM. A p < 0.05 was interpreted as statistically significant. PPY was successfully immobilized in CHI via a chemical oxidative polymerization method. Pyrrole monomers were polymerized into PPY in a water system and grafted onto the non-conductive CHI backbone using FeCl3 (Figure 1A). The synthesized PPY:CHI was liquid in form (Figure 1C). To achieve a hydrogel state, the addition of glutaraldehyde cross-linked the CHI backbone structures, creating a PPY:CHI hydrogel (Figure 1C). Crosslinking occurred on the backbone of CHI through reaction between the aldehyde group of GA and free amino group (-NH2) of CHI. As the amount of GA increased, the degree of gelation was faster, indicating more free amino groups were crosslinked by GA (Figure 1B). To normalize gelation time between CHI and PPY:CHI, a final GA concentration of 0.004% and 0.04% solution was used for CHI and PPY:CHI, respectively to achieve a gelation time of ~15 s (n=4, Figure 1B). Both CHI and PPY:CHI hydrogels were used to coat cell culture dishes (Figure 1C). Generation of a polypyrrole-chitosan hydrogel. (A) Pyrrole monomers were added to a chitosan (CHI) solution to create polypyrrole-chitosan (PPY:CHI) polymers. These polymers were then cross-linked by the addition of glutaraldehyde in order to create hydrogels. (B) Hydrogel gelation speed was altered by the amount of glutaraldehyde added. To achieve a similar gelation speed of both CHI and PPY:CHI, a final concentration of 0.004% and 0.04% glutaraldehyde was added to CHI and PPY:CHI, respectively (n = 4). (C) Polymer hydrogels were semi-rigid yet remained flexible enough to coat cell culture dishes. Data are shown as mean ± SEM. Cell viability is unaffected by biomaterials. (A) Neonatal cardiomyocytes were seeded on uncoated polystyrene (control), chitosan (CHI)-coated, and polypyrrole:chitosan (PPY:CHI)-coated cell culture dishes for 3 days. Cells were then treated with 0.4% trypan blue to stain dead cells (arrows) and 1:500 dilution of 4',6-diamidino-2-phenylindole (DAPI) to label all cells. Images were taken using a fluorescence microscope. (B) Quantification of (A). No significant differences in viability were observed between cells seeded on the three materials (n = 7). Data are shown as mean ± SEM. Biomaterials should be biocompatible to support cell growth so that it serves its function as an extracellular scaffold. To assess the biocompatibility of CHI and PPY:CHI, neonatal rat CMs were cultured on the biomaterials for 3 days. We used CMs as they are the most relevant cell type and represent the interaction between cells and conductive biomaterials when injecting the biomaterial hydrogel into the heart. The morphology and survival of CMs were evaluated. As shown in Figure 2A, CMs were able to adhere to both control and biomaterial-coated dishes and demonstrated a spindle-shaped morphology in all experimental groups. Since CMs can proliferate during the very early neonatal period [22, 23], we quantified the percentage of live/dead cells at 3 days of culture to evaluate CM viability. Quantification of trypan blue-positive cells showed no significant difference in the cell survival rate between CMs seeded on biomaterial-coated dishes and the control group (Figure 2B). These results showed that both CHI and PPY:CHI are biocompatible and non-toxic. The ability of a conductive polymer to support electrical signal transport is critical when it comes to cardiac applications. To date, many studies reported that electrical stimulation enhances cardiac-specific protein expression, cell alignment and coupling, and ultrastructural organization similar to native cardiac tissue [24-26]. However, it will be interesting to investigate whether the biological electrical signal generated by CMs cultured on a conductive biomaterial can synchronize neighboring CMs without external stimulation. At a lower magnification of 0.63X in control uncoated dishes, Ca2+ transients in CMs originating in the peripheral population propagated toward the central population, but were unable to activate central CMs (n=3; Figure 3 and Movie S1). Likewise, Ca2+ transients in CMs originating in the central population were unable to activate peripheral CMs. Thus, no synchronization was observed. A similar result was observed in cells plated on CHI-coated culture dishes, as the peripheral population CMs were unable to activate the central population CMs, and vice versa (n=3; Figure 3 and Movie S3). 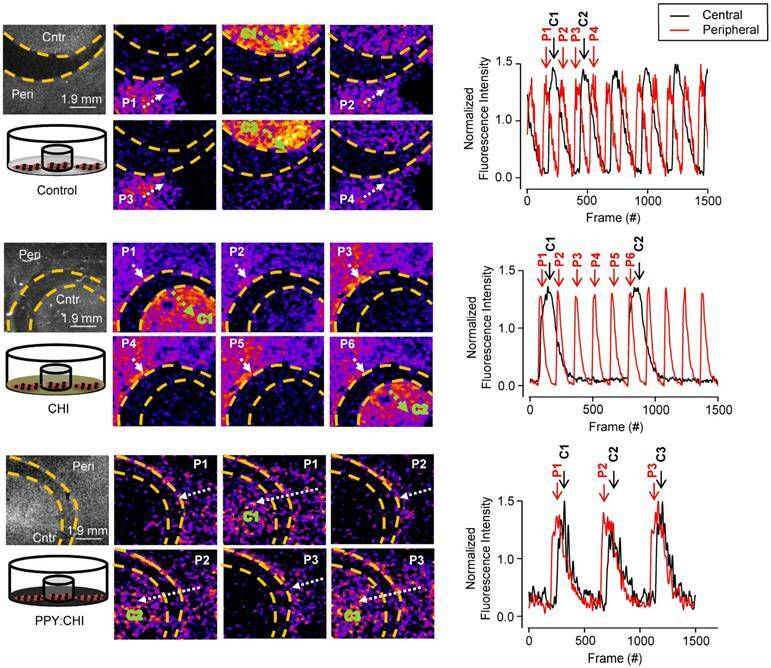 Finally, CMs plated on PPY:CHI-coated dishes were fully synchronized, as all observed Ca2+ transients from the peripheral population were able to activate central population cells (n=3; Figure 3 and Movie S5). The beating frequencies of the two CM groups in the PPY:CHI dish were the same with no signal delay, indicating PPY:CHI facilitated the propagation of the electrical signal generated by the peripheral CMs group and this biological electrical signal was able to excite the central CMs group. These results indicated that PPY:CHI is capable of bridging and synchronizing two physically-isolated CM populations. We also observed the cells with a high 6.3X magnification view to evaluate possible cellular interactions (Movie S2, Movie S4, and Movie S6). However, only a very small view could be captured, which was unable to show synchronized beating of the two CM groups. Polypyrrole-chitosan hydrogel improves electrical synchronization of isolated cardiomyocyte populations. Neonatal cardiomyocytes (CMs) were seeded and cultured on uncoated polystyrene (control), chitosan (CHI)-coated, and polypyrrole-chitosan (PPY:CHI)-coated dishes for 5 days. A glass ring was placed within the dishes in order to separate the CMs into peripheral (P) and central (C) populations. Propagation of spontaneously-generated CM calcium transients was observed by measuring Fluo-4-AM signal (each separate transient is marked by a separate number). In control and CHI-coated dishes, calcium transients were observed in both peripheral (white arrows) and central (green arrows) populations. Transients could not propagate past the acellular region, and no synchronization was observed. In PPY:CHI-coated dishes, peripheral population-originating calcium transients were able to propagate to the central population, and calcium transient synchronicity was observed (n=3). Representative fluorescence intensity tracings of ring and dish populations are presented (far right panel). Representative recordings are provided as Movies S1-2 (control), Movies S3-4 (CHI), and Movies S5-6 (PPY:CHI). After demonstrating that PPY:CHI can facilitate synchronous beating of two isolated cell populations in vitro, we then examined whether PPY:CHI can exert similar effects in vivo. We thus induced scar formation on the anterior wall of the left ventricle by cryoinjury; saline, CHI, or PPY:CHI was injected at 7 days post-injury. The electrical signal conduction velocity of the injured left ventricle was examined at 28 days post-injection. Optical mapping of ex vivo Langendorff-perfused hearts using a voltage-sensitive dye was used to evaluate electrical impulse conduction velocity across the scar tissue of all groups (Figure 4). The results showed that both saline-treated (57.7±2.5 cm/s; Movie S8) and CHI-treated (47.4±2.5 cm/s; Movie S9) groups exhibited significantly decreased longitudinal conduction velocities by 30-40% in comparison with uninjured left ventricles (81.3±0.59 cm/s; Movie S7). However, the longitudinal conduction velocity in PPY:CHI-treated hearts (74.3±4.7 cm/s; Movie S10) was similar to uninjured controls and significantly greater than saline- and CHI-treated groups. This result showed that PPY:CHI improved the conduction velocity across scar tissue. Injection of polypyrrole-chitosan improves conduction velocity across scar tissue. Rat hearts were subjected to cryoinjury (injured region marked by dashed yellow lines). Seven days later, injured rat hearts were injected with saline, chitosan (CHI), or polypyrrole:chitosan (PPY:CHI). Rats were sacrificed 28 days later and electrical signal conduction kinetics of the ex vivo Langendorff-perfused rat hearts were measured by perfusing rat hearts with the voltage-sensitive dye di-4-ANEPPS. (A) Optical mapping of electrical impulse propagation (black arrows) through the left ventricle (LV) of the heart was performed. The start point is marked with a star. (B) Electrical impulse propagation wave velocity was calculated as the distance travelled up the LV (white dashed arrows)/time elapsed. Velocity was significantly decreased post-cryoinjury, and injection of saline or CHI did not affect this velocity. However, PPY:CHI-treated hearts exhibited conduction velocities that were similar to uninjured hearts, and significantly greater than saline- or CHI-injected cryoinjured hearts (n = 3 for healthy control, n = 4 for saline, n = 4 for CHI, and n = 5 for PPY:CHI; * p < 0.05). Data are shown as mean ± SEM. Representative recordings are provided as Movie S7 (healthy), Movie S8 (saline), Movie S9 (CHI), and Movie S10 (PPY:CHI). In addition, we also assessed electrical pulse propagation with ECG. 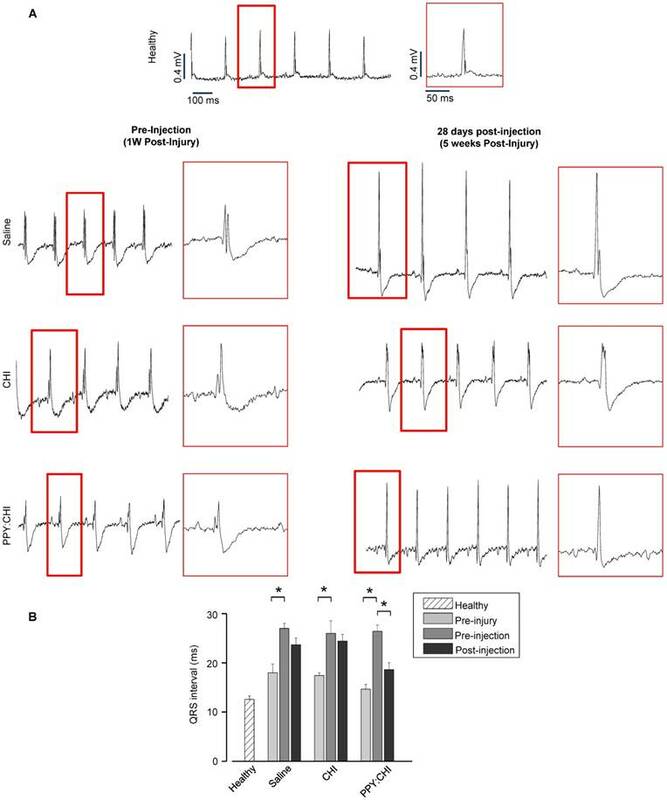 Baseline ECGs were recorded prior to cryoinjury to ensure all rats had normal cardiac electrical activity (QRS interval: saline, 18±1.8 ms; CHI, 17.4±0.5 ms; PPY:CHI, 14.6±0.9 ms; Figure 5A). At 7 days post-cryoinjury, all rats exhibited 50-80% prolonged QRS intervals (saline, 27±1 ms; CHI, 26±2.5 ms; PPY:CHI, 26.4±1.3 ms) compared to both the healthy control group (13±0.6 ms) as well as pre-injury baseline values, indicating that cryoinjury disrupted normal electrical signal propagation (Figure 5B). However, at 28 days after biomaterial injection, rats injected with PPY:CHI demonstrated 20% shorter QRS intervals (18.6±1.4 ms) compared to saline-treated (23.7±1.4 ms) and CHI-treated (24.4±1.3 ms) animals. All rats survived until the endpoint and no arrhythmias were observed. This result demonstrated that PPY:CHI restored electrical conduction across scar tissue to approximately normal levels. Ex vivo stimulation was employed to assess the excitability, contractility, and fatigability of isolated muscle. To confirm that the PPY:CHI conductive hydrogel supports conduction across scar tissue, we developed an assay to evaluate the conductivity of scar tissue obtained from the hearts in our in vivo study (Figure 6A). All experiments were done immediately after retrieval of hearts to ensure viability of tissue. We stimulated isolated myocardial scar tissue from one end and used electromyography (EMG) to detect electrical signals at the other end. Myocardial scar tissue from PPY:CHI-treated animals showed 300-350% higher EMG signal amplitude compared to scar tissue from saline- and CHI-treated animals (Figure 6B-C). This result was consistent with the previous optical mapping data and further confirmed that PPY:CHI improved the conduction velocity of scar tissue. Polypyrrole-chitosan injection decreases QRS duration. (A) Electrocardiogram (ECG) measurements were taken from cryoinjured hearts prior to injection of saline, chitosan (CHI), or polypyrrole-chitosan (PPY:CHI) 1 week post-injury or at 28 days post-injection (5 weeks post-injury). QRS complex duration was examined and quantified (B) Cyroinjury resulted in significant prolongation of the QRS complex in rats at 1 week post-injury. Injection of PPY:CHI significantly decreased QRS complex duration in injured hearts, whereas CHI and saline injection did not affect QRS complex duration (n = 4 for each group; * p < 0.05). Data are shown as mean ± SEM. Polypyrrole-chitosan injection promotes electrical signal conductivity in cryoinjured myocardial tissue. (A) An electromyograph (EMG) recorder was used to measure propagation of generated electrical pulses across a cryoinjury-induced myocardial scar in the presence or absence of chitosan (CHI) or polypyrrole-chitosan (PPY:CHI) biomaterials. (B) Average voltage was significantly elevated in scar tissue injected with PPY:CHI compared with scar tissue that received CHI or saline (n = 4, * p < 0.05). (C) Representative tracings of measured electrical signal are presented. Data are shown as mean ± SEM. Myocardial fibrosis is a major pathological change following an MI. The fibrotic tissue not only decreases the contractile function of the heart, but also impairs myocardial electrical signal propagation, leading to ventricular tachyarrhythmias . The fibrosis imposes collagen strands between normal CMs, which increases external resistance and causes abnormal coupling between cells. The resulting abnormal conduction may contribute to morbidity and mortality following an MI . Restoring the normal electrical conduction pathway is the optimal solution for the preservation of cardiac function. A variety of techniques have been evaluated, such as cell transplantation. 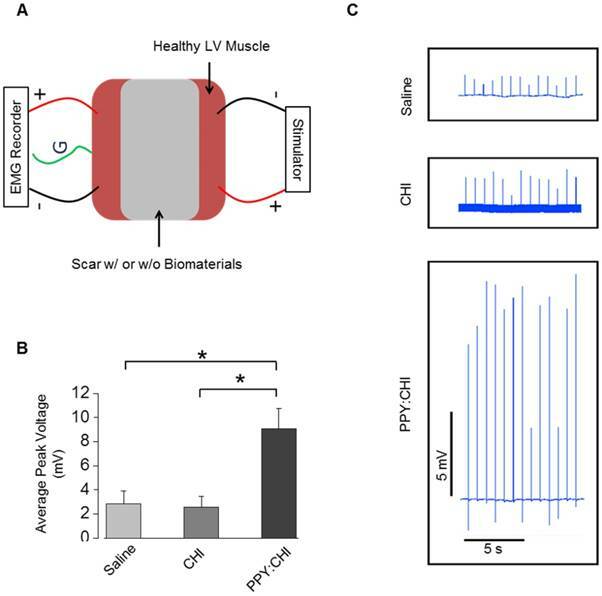 Human embryonic stem cell-derived CMs can pace a swine heart with AV block , and mesenchymal stem cell-derived CMs are able to restore conduction and improve cardiac contractility when transplanted into the infarcted rat heart . However, arrhythmias have been observed using these experimental preparations. Biomaterials have been shown to stabilize the infarct region and prevent or delay scar thinning and ventricular dilatation [30-32]. We previously described the synthesis of the PPY:CHI conductive biomaterial, its biocompatibility in vitro and in vivo as well as its possibility for improving conduction around the border zone of the scar . In the in vitro study, we investigated the conductive property of the new material with muscle tissue by electrical stimulation. In the in vivo study, since it was a proof-of-concept paper, we evaluated the application of the conductive biomaterial by injecting it into the marginal region around the damaged myocardium. However, improving electrical impulse conduction across scar tissue using electrically-conductive biomaterials has not been fully investigated. The present study evaluated the effect of the PPY:CHI conductive biomaterial on synchronizing the beating of two isolated cell clusters in vitro and improving electrical impulse propagation across scar tissue in vivo. Our data showed that PPY:CHI was biocompatible, as it did not deleteriously affect the viability of neonatal rat CMs. In addition, PPY:CHI improved electrical signal synchronization between two isolated CM clusters. 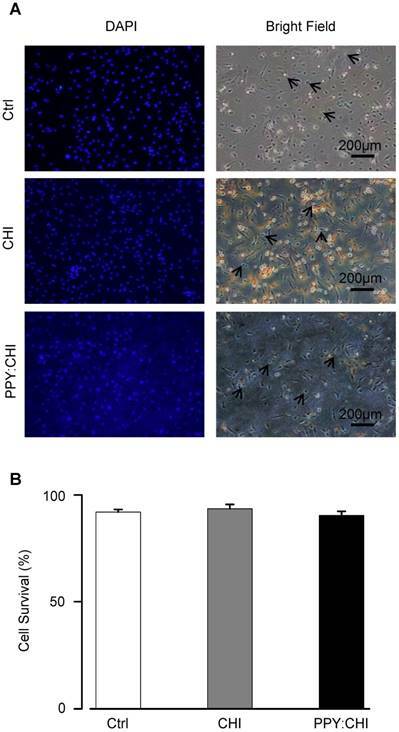 When injected into the scar tissue of cryoinjured rat hearts, the PPY:CHI hydrogel changed the fibrotic tissue composition toward a more conductive status and improved the longitudinal electrical impulse velocity compared with saline- or CHI-injected rat hearts. Pyrrole is a heterocyclic aromatic organic compound that can be doped and polymerized by chemical oxidation. Polypyrroles are conductive materials that have been investigated extensively in several fields. A major disadvantage of PPY is that it is mechanically rigid, making it difficult to add into a biological system. CHI is the second most abundant polysaccharide in nature and it has been shown to enhance stem cell survival in an ischemic rat heart model , reduce infarct size, and improve heart function in a rat infarction model . In the current study, we activated a side chain of CHI using an acidic solution and conjugated pyrrole onto CHI followed by elongation by oxidation. The conjugation of the conductive polymer PPY to a non-conductive CHI backbone did not confer any deleterious effects on CHI biocompatibility. It also overcame the stiffness of PPY. PPY:CHI was water soluble and became a hydrogel after cross-linking. Indeed, we demonstrated that neonatal rat CMs cultured on PPY:CHI-coated dishes were able to properly and firmly adhere, remained mononucleated during the first 3 days of culture, and displayed proper spindle-shape morphology. Furthermore, no change in cell survival was observed in CMs cultured on PPY:CHI-coated dishes compared to those cultured on control dishes. These findings establish that the conductive PPY:CHI hydrogel was biocompatible. Electrical activation in the heart is achieved through the specialized cardiac conduction system, which ensures synchronous contracture of all portions of the left ventricle. Following coronary occlusion, the necrotic and apoptotic CMs are replaced by non-conductive fibrotic tissue. Although traditional pharmaceutical interventions significantly improve morbidity and mortality after an MI , delayed electrical impulse conduction across the scar tissue results in asynchronous contraction of some heart segments, which may contribute to progressive HF . Conductive polymers may have the potential to improve conduction across the fibrotic tissue to restore synchronous contraction. Our data showed that a PPY:CHI conductive hydrogel can improve the contractile synchronization of two isolated CM populations in vitro. Many researchers have shown that external electrical stimulation promotes cell-cell electrical coupling and maturation of stem cell-derived CMs [35, 36]. When cultured in vitro on PPY:CHI conductive polymer, it is possible that the intrinsic electrical signal of CMs can act as an electrical source to stimulate neighboring CMs and promote synchronous beating through the PPY:CHI structure. Future work is required to investigate the mechanisms that conductive biomaterials use to promote electrical signal synchronization. The conductive property of PPY:CHI was also investigated in vivo using a cryoinjury model. The reason for choosing this model instead of the usual coronary artery ligation model of MI was because cryoinjury produces a uniform scar size, whereas the MI model produces a variable extent of cardiac muscle injury . Because the scar is much more homogeneous with a cryoinjury-induced scar, this substrate presents a much more challenging test environment for restoration of electrical conduction. In addition, we were able to consistently obtain a uniform scar size and evaluate conduction velocity in the same region of the heart without any other confounding factors that may impact electrical conduction. 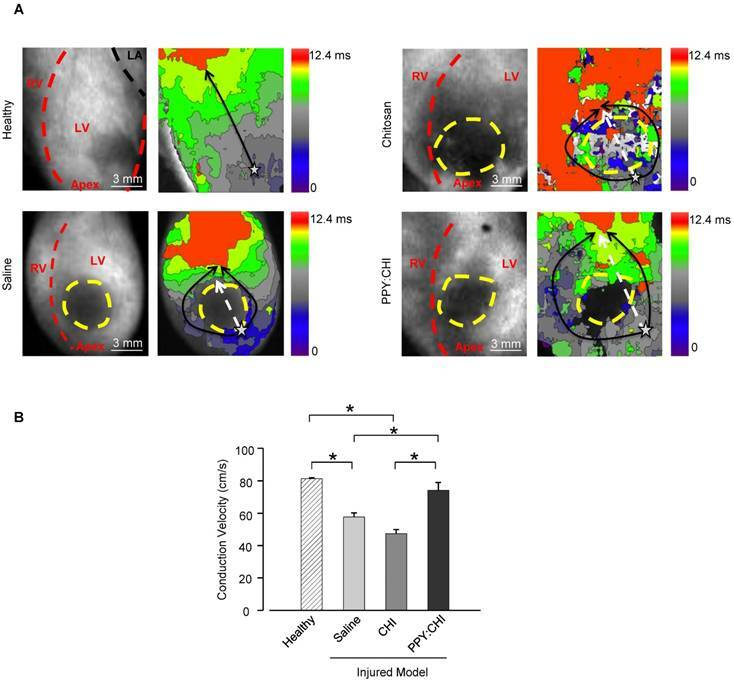 Our optical mapping data showed that intra-scar injection of PPY:CHI significantly improved longitudinal electrical conduction velocity across the left ventricular scar tissue in vivo compared with saline- or CHI-treated groups. These findings were further supported by our ex vivo studies, which demonstrated that electrical impulse conduction across isolated myocardial scars was also significantly improved in scar sections that received PPY:CHI injection. These improvements are expected to be due to the compositional changes of scar tissue post PPY:CHI injection. In addition, animals injected with PPY:CHI had significantly shorter QRS intervals, suggesting more normal electrical impulse conduction in the PPY:CHI-treated group. However, it must be noted that our cryoinjury model, while producing a uniform scar, did not induce abnormalities in cardiac function (Figure 1). Whether the observed enhancement of electrical impulse propagation across the scar can positively affect heart function will be a key focus of future investigations. Our findings may have broad implications for heart disease-related conduction abnormalities. MIs can cause myocardial damage and scar formation at multiple sites and impair electrical impulse propagation at many locations . Improving fibrotic tissue conductivity and bridging isolated surviving myocardial regions may restore the synchronicity of cardiac contraction and may limit progressive ventricular dysfunction. Indeed, electrical field stimulation has been shown to guide CM alignment, ultrastructural properties, coupling, and contraction synchronicity in an in vitro construct . We synthesized a PPY:CHI conductive biomaterial that is biocompatible and electrically conductive. It synchronized the contraction of physically-isolated CM clusters without external electrical stimulation. Our in vivo data indicate that PPY:CHI can also improve electrical conduction across a fibrotic scar in the injured heart. CM: cardiomyocytes; CHI: chitosan; ECG: electrocardiogram; EMG: electromyography; HF: heart failure; MI: myocardial infarction; PPY: polypyrrole. We thank Dr. Leigh Botly for assistance with manuscript preparation and editing. This work was supported by the Heart and Stroke Foundation of Ontario [G140005765 to R-K.L.]. R-K.L. holds a Tier 1 Canada Research Chair in Cardiac Regeneration. Z.C. was supported by the Heart & Stroke/Richard Lewar Centre of Excellence Studentship. N.C.N. was supported by a Toronto General Hospital Research Institute Postdoctoral Fellowship. T.M.Y. holds the Angelo & Lorenza DeGasperis Chair in Cardiovascular Surgery Research.